BRICK FACED CONCRETE WALLS INC., provides you with steel-reinforced solid concrtete walls and 40% more concrete than block walls, which saves you time and money! Poured concrete walls are the #1 choice for separating residential from commercial zones. Poured walls are ideal for retaining ground or parking lots on one side. Nearly maintenance free and super strong unlike pre-cast walls. Poured concrete walls provide you with a beautiful brick-textured finish. Proving to be more economical than actual brick, which greatly reduces your cost and our installation time. Simulated Brick - Smooth Finish - Adobe. Cast in place job site construction. Forms are adaptable for wall thickness from 6 to 24 inches with heights up to 20 feet in a monolithic pour. NOTE: Height and thickness of wall and footing may vary with grade, preference, or specifications. 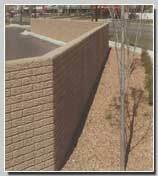 For retaining walls, additional re-bar is recommended. Poured concrete wall foundations or trench foundations with steel-reinforcement and/or anchor bolts and anchor plates. Brick Faced Concrete Walls Inc. Comments, questions or difficulties with this site? Please contact the Web Manager.